The United States of America was a great country of funiculars but American people do not know or have forgotten. 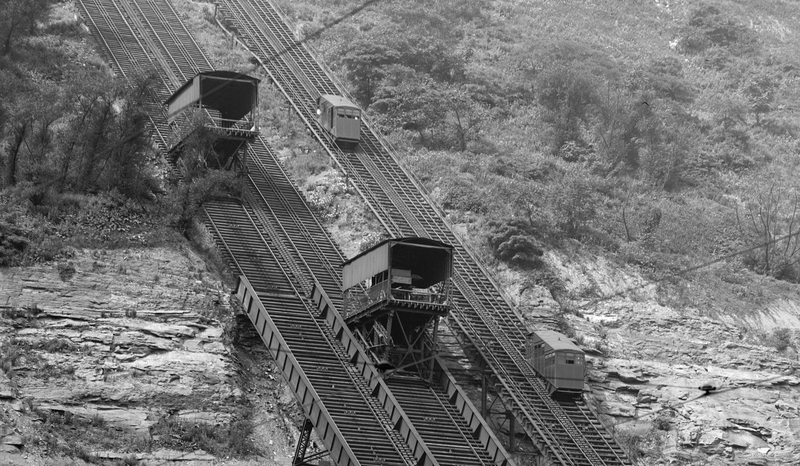 The United States of America has built the most spectacular funiculars but they have practically all disappeared for a long time. 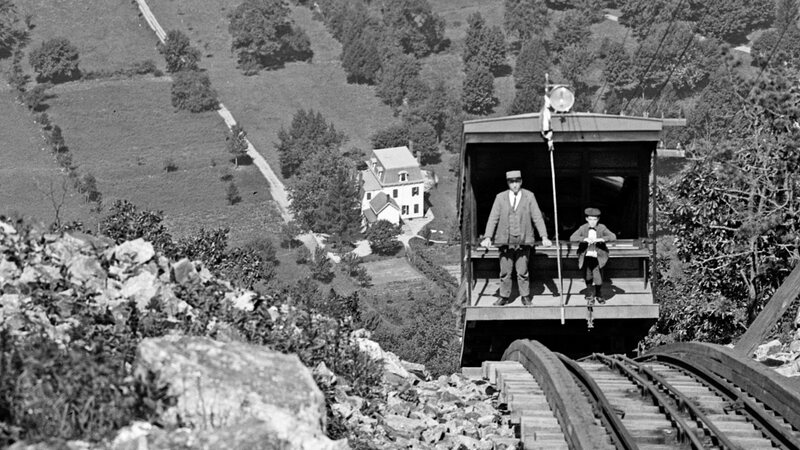 Here are more than fifty lost or stopped funiculars in order to remember what was the great era of American funiculars. This list is not exhaustive and is just a selection of the most representative ones. 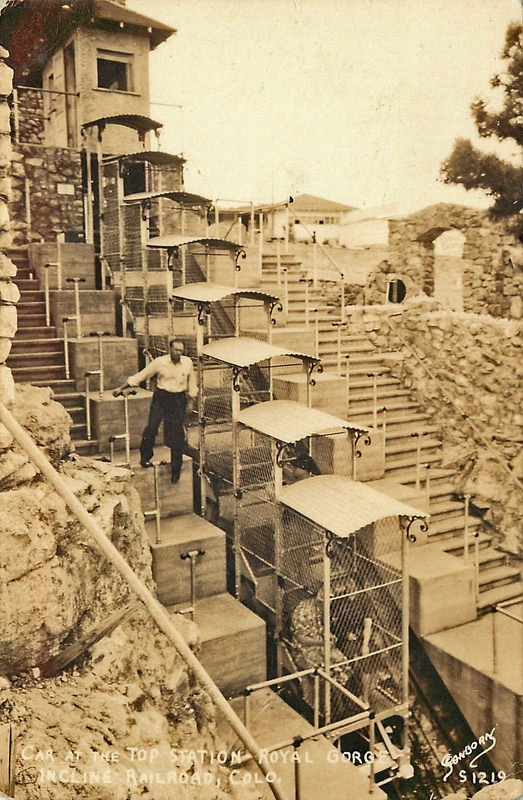 Located on Catalina Island off Los Angeles, the incline was used to link Avalon and the amphitheater to Pebbly Beach on the other side of the hill. Court Flight incline was the other funicular in downtown Los Angeles. 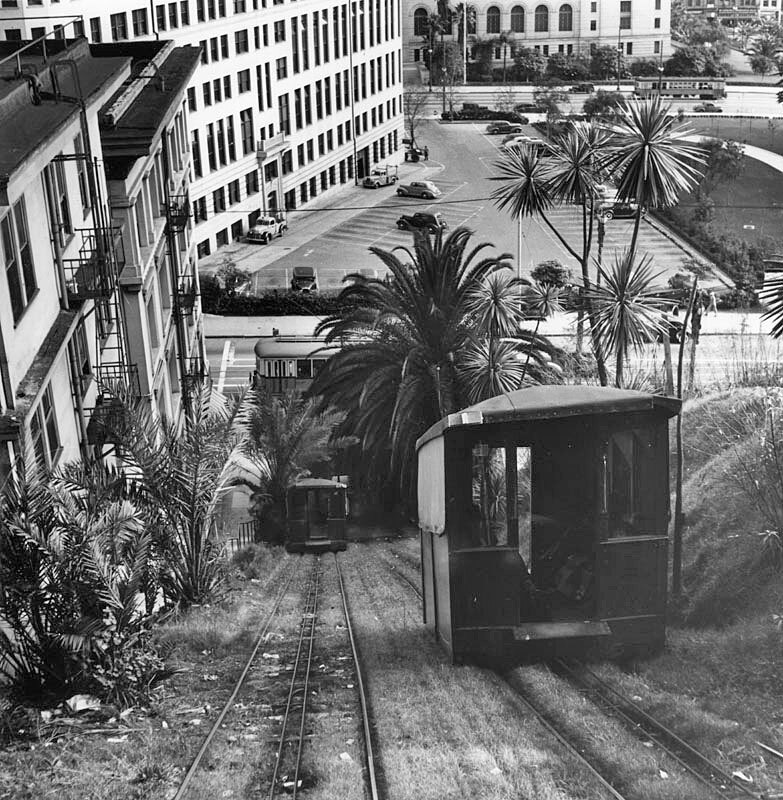 Not so famous as Angels Flight, which was opened in 1901 and is still active, Court Flight funicular linked Bunker Hill to Court Street. 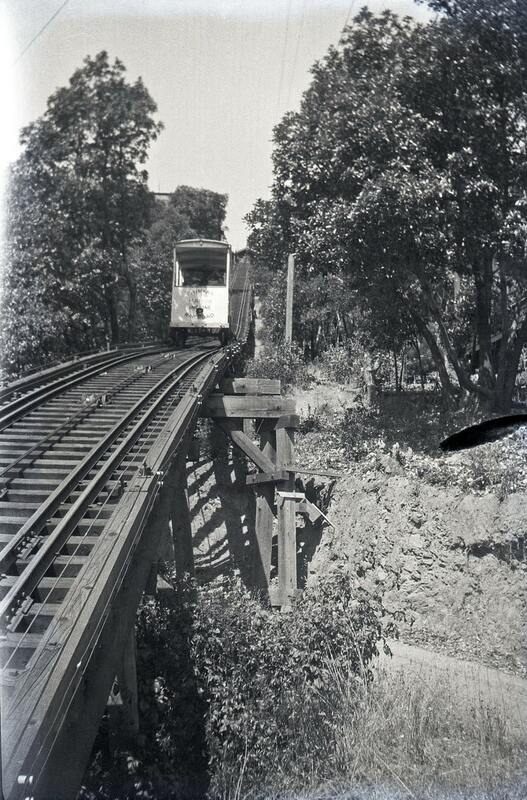 Fairfax Manor Incline Railroad was used to access Manor Hill near Redwood in Marin County and promote promote sell lots. 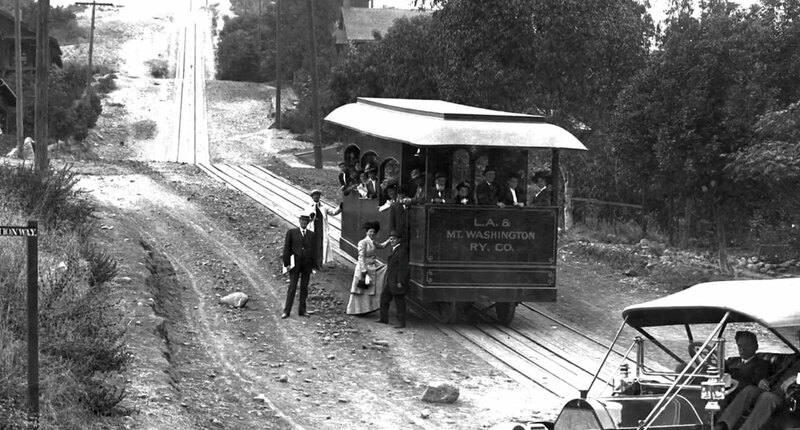 The Los Angeles & Mount Washington Railway was a funicular which was built to develop the summit of Mt. Washington Hill. 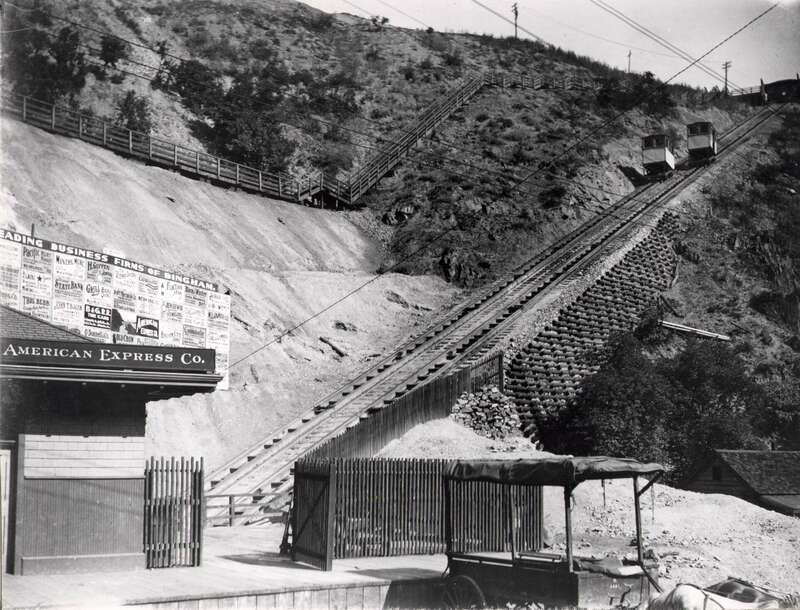 The Mount Lowe Great Incline was part of a great set of railways built to reach top of Mt. Lowe from Pasadena near Los Angeles. 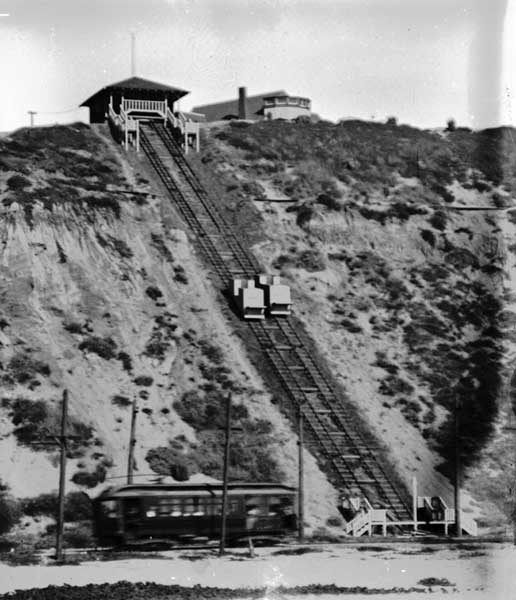 This funicular was built to access the beach from Playa Del Rey, between the actual Marina Del Rey and Los Angeles International Airport. 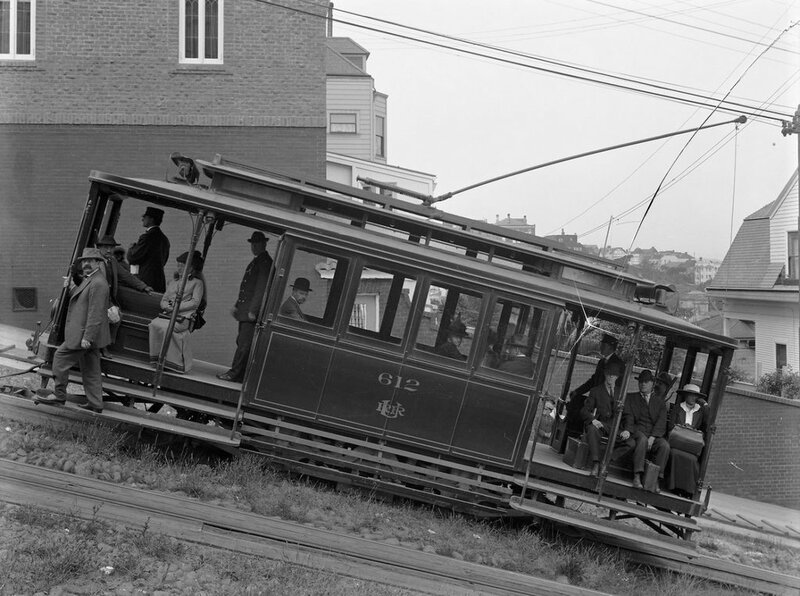 The Fillmore Hill incline was an independent counterbalance funicular to climb from Broadway to Green and was not connected to the classical San Francisco cable cars. 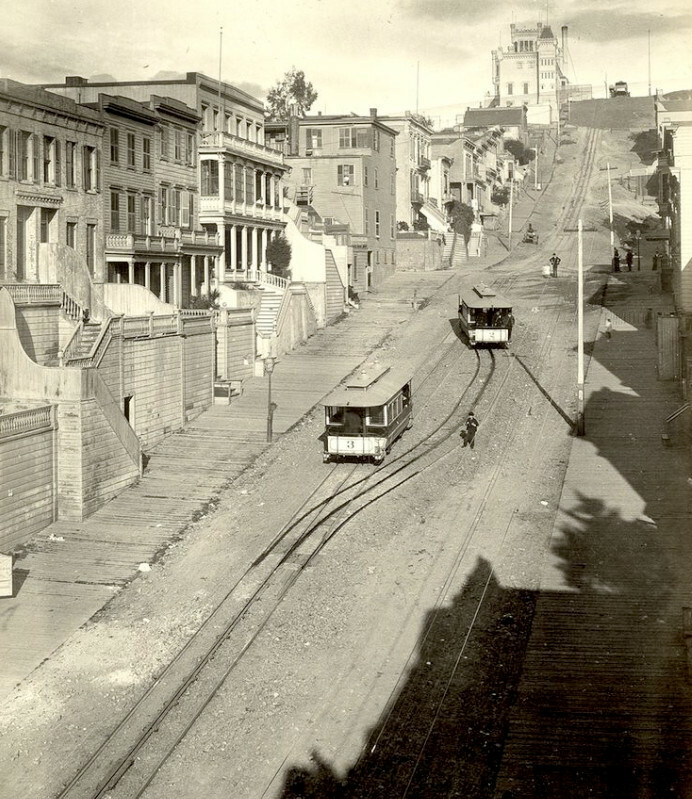 As Fillmore Hill, The Telegraph Hill incline was an independent counterbalance funicular to climb from Broadway to Green and was not connected to the classical San Francisco cable cars. It ran on Greenwich Street from Powell to the Pioneer Pavilion. Shasta Springs was a famous resort near Mount Shasta volcano in North California. 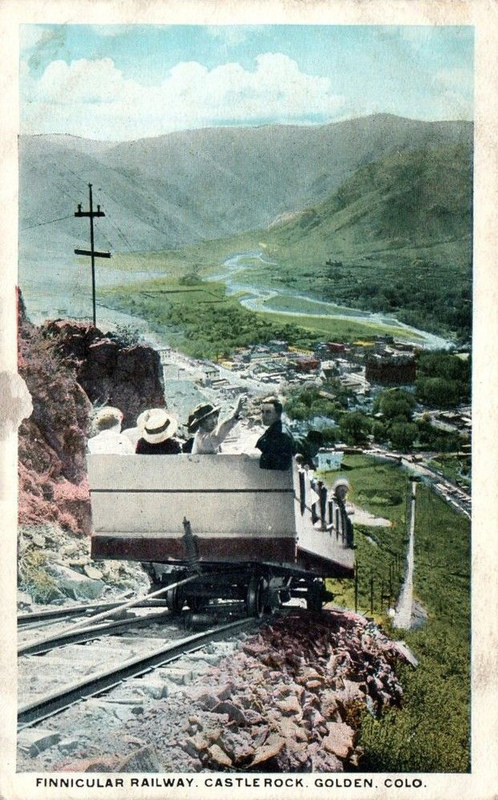 A funicular railway was used on the Northwest face of South Table Mountain where a Casino was built on top of Castle Rock above Golden near Denver. 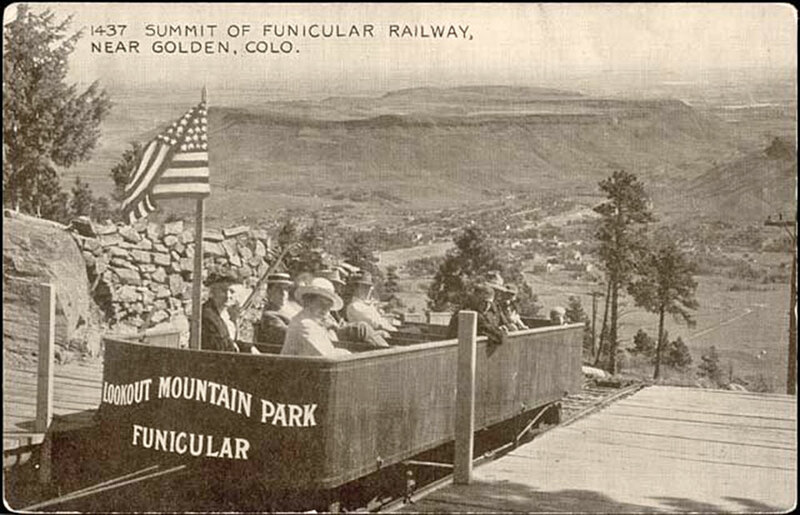 In 1912, the first funicular of Golden was built at top of the Lookout Mountain Park. Mount Manitou incline is certainly the most famous of US disappeared funiculars may be because it was recently closed. Its empty track is today used for vertical runs. 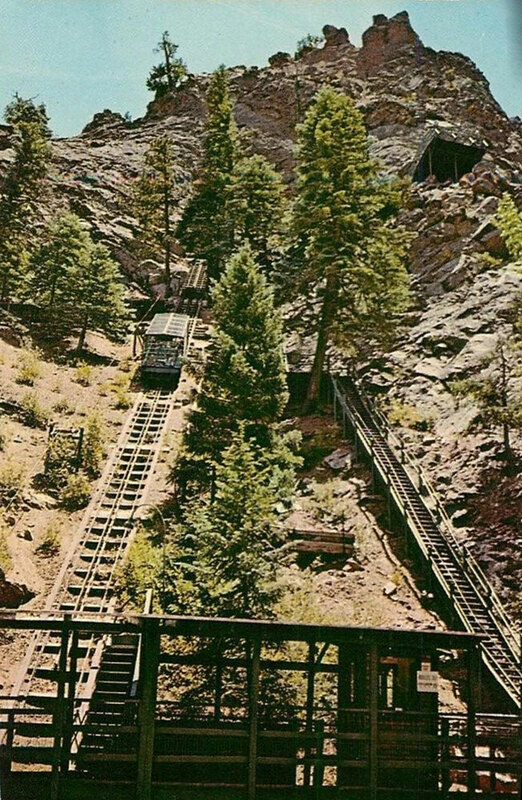 Few meters only from the famous Mount Manitou Incline and the Pike Peak Cog Railway, there was may be the most unknown US funicular… the Manitou Red Mountain Incline. 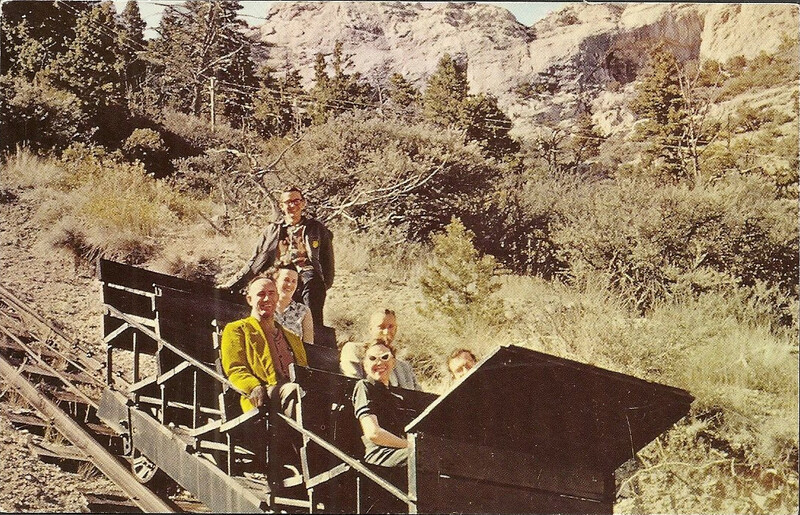 The Mount Morrison Incline Railroad was also an unknown and ephemeral funicular but as spectacular as those from Manitou Spring. The Royal Gorge Incline was in operation since recently but was forced to stop because of big damage after fire in the area. Located near Colorado Springs, the Seven Falls is a famous natural spot. 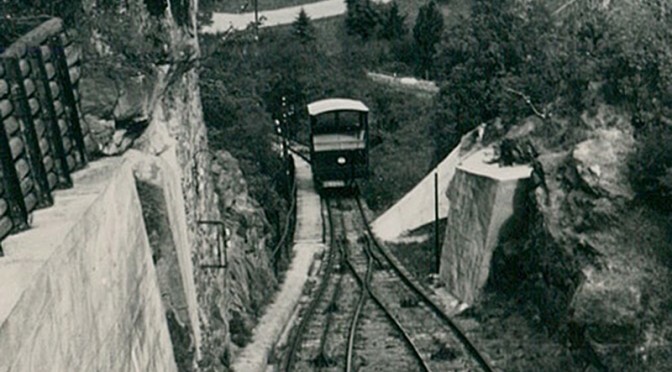 A funicular was first built to help visitors to access the gorge… today it is replaced by an underground vertical lift. 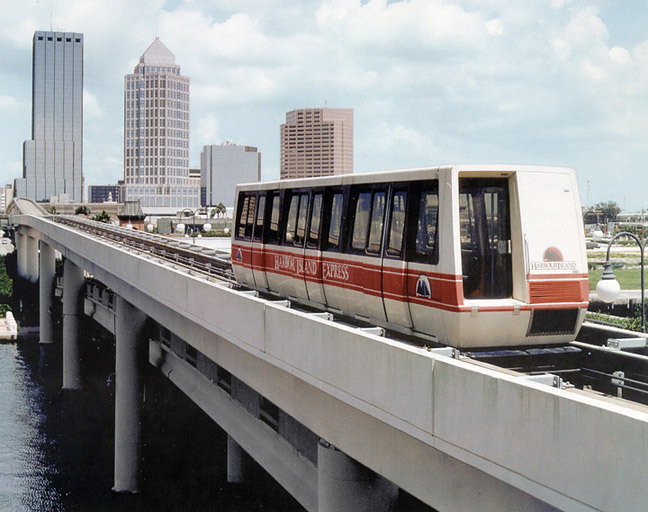 A very short life for this cable Automated People Mover which was built to link the Harbour Island to downtown Tampa in Florida. Today, every thing is gone. 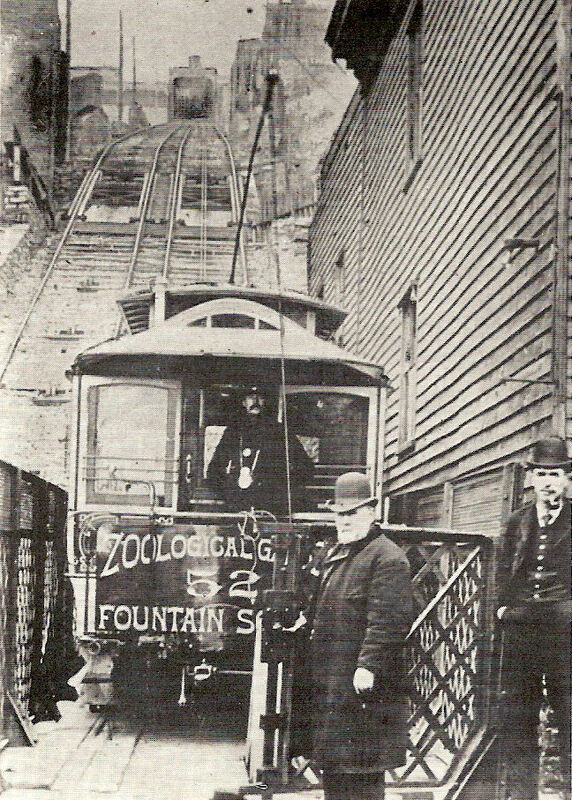 On 11th Street there was the second funicular of Dubuque which was less famous than Fenelon Place Elevator which is on 4th Street. 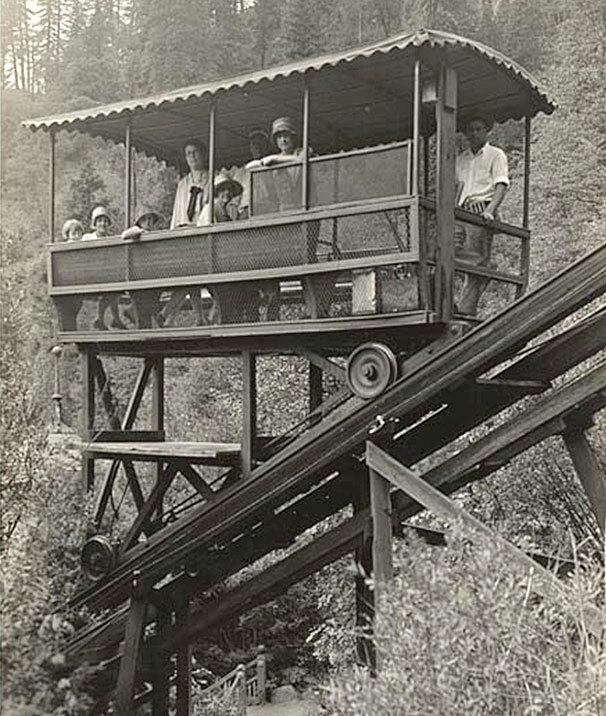 This funicular was located inside Western Michigan University of Kalamazoo. In 2002 a replica was built by some students but it is only a static exposition. 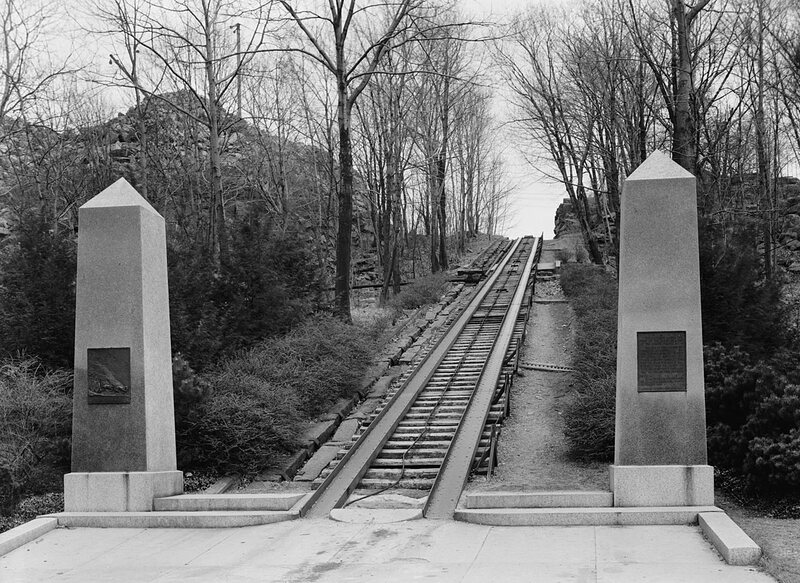 The Angel’s Flight Inclined Railway of Macatawa was built to reach the top of Lookout Point over Lake Michigan. 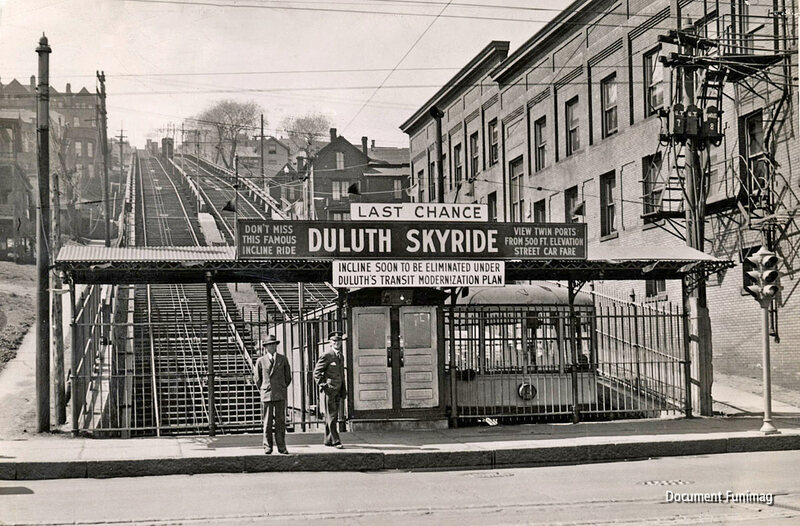 This is a very famous funicular which was a real icon of Duluth during more that 40 years. More informations about the Duluth 7th Avenue West Incline. 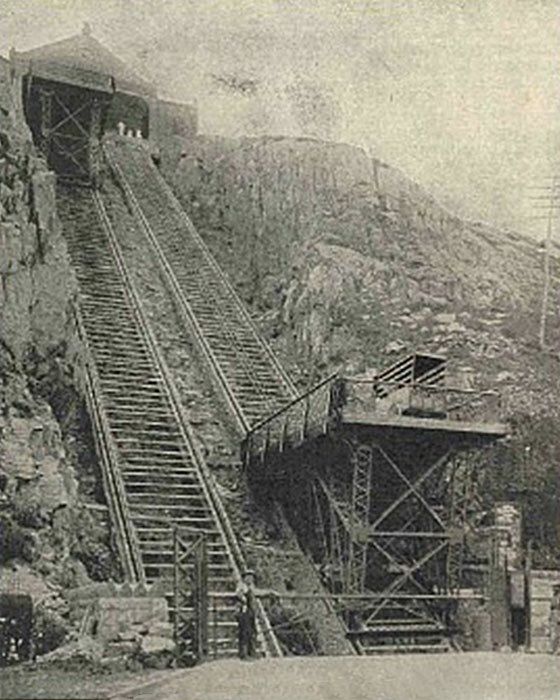 Granite Railway & Granite Incline were located south of Boston. They were the first railway and the first inclined railway in America. They were built in 1826 transport granite stone from Quincy quarry to erect the Bunker Hill Monument of Boston for the fiftieth anniversary of the Battle of Bunker Hill. 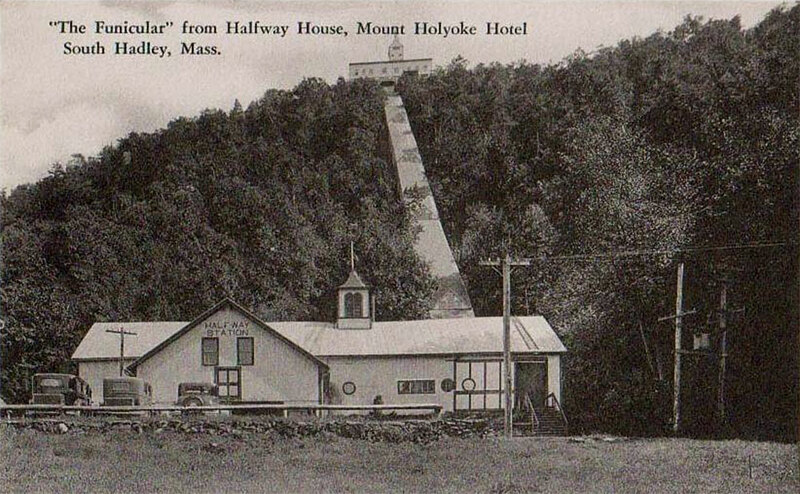 A tramway and a covered funicular was built to transport tourists to the Mont Holyoke Hotel at the top of the hill. 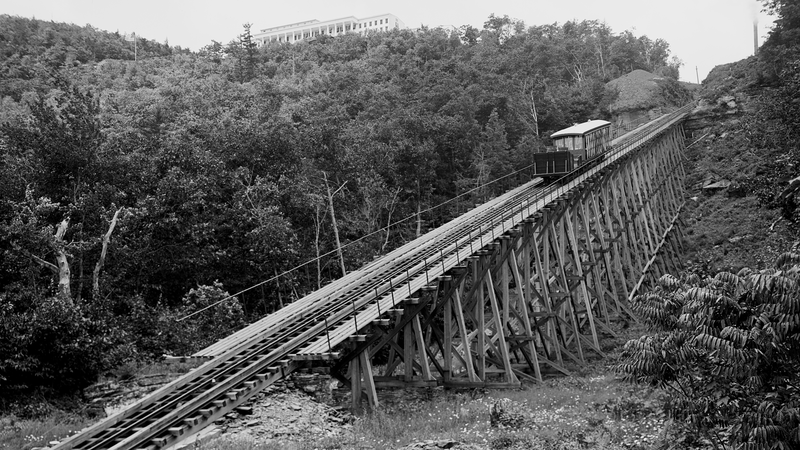 Located new Holyoke, a railroad and a funicular were built to reach the summit of the Mount Tom above the western bank of the Connecticut River. 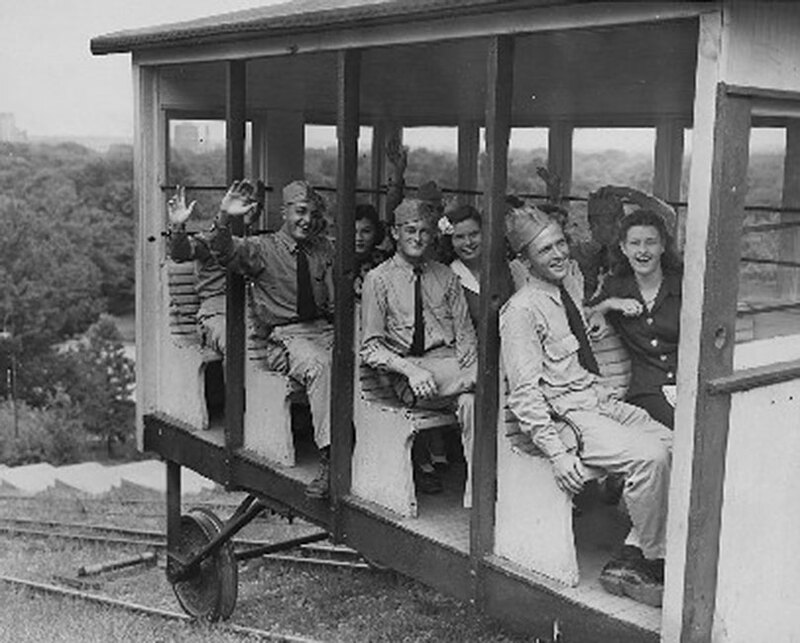 Lewis and Clark Caverns were first accessible with a Jeep railway and a funicular. Unfortunately both of them were forced to close for administrative reasons. 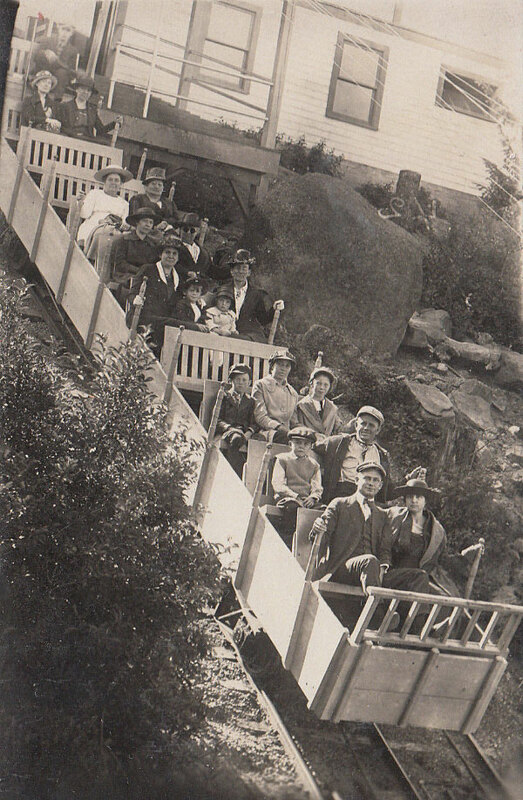 Ghost Town in the Sky is a Wild West-themed amusement park on top of a mountain in Maggie Valley which was accessible by a double funicular composed of four cars of 48 passengers each. The park is now accessible by two chairlifts. 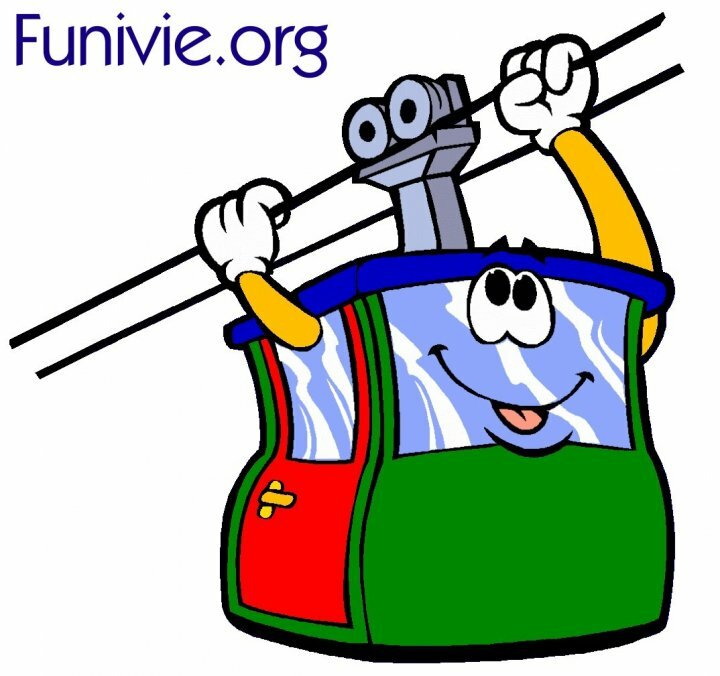 Cranmore Skimobile was composed of 192 cable hauled cars in two sections to transport skiers and sightseers on top of Mount Cranmore in North Conway (New Hampshire). 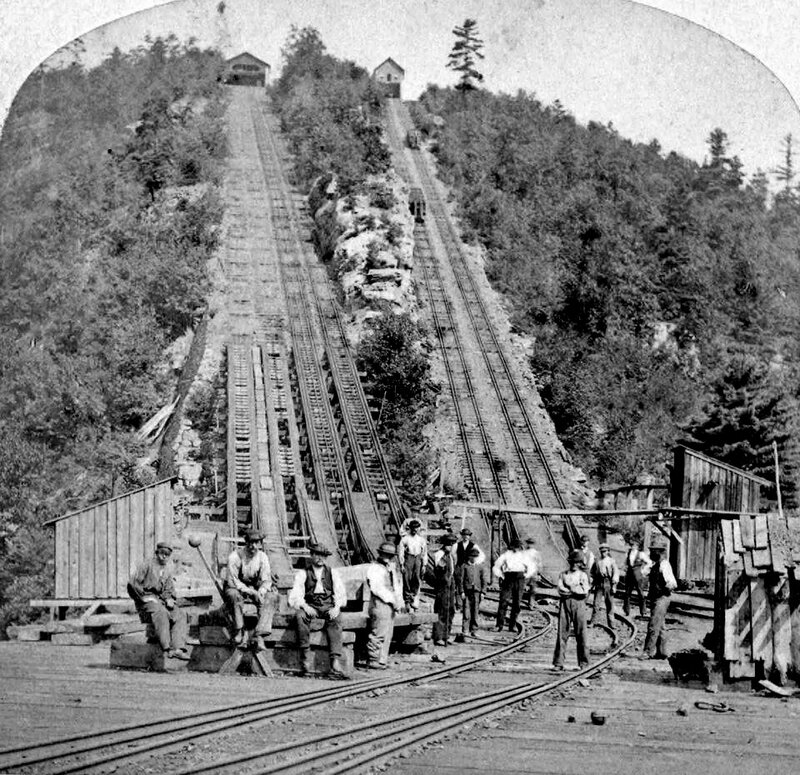 Uncanoonuc Incline Railway and Development Company built an electric railway from Goffstown to the top of Mount Uncanoonuc near Manchester (New Hampshire). 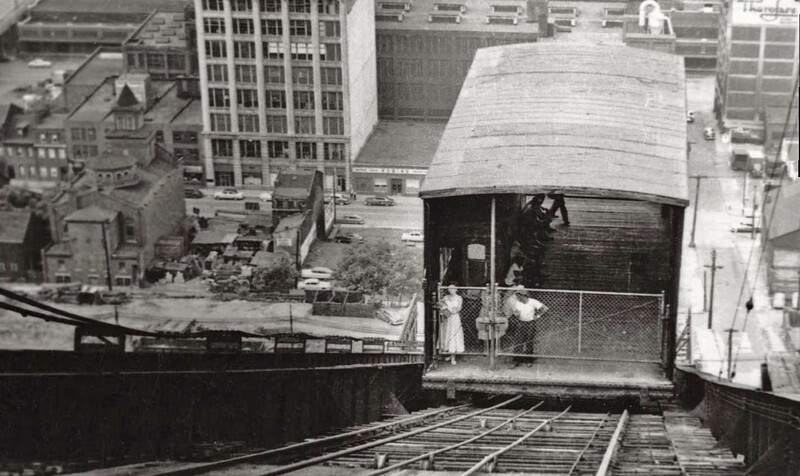 The Hoboken wagon lift was a funicular used to lift vehicles from the foot of Paterson Plank Road to Jersey City Heights and close to the famous Hoboken Elevated Railway railway trestle. The Morris Canal was a 172 km canal used to transport coal on boats from Delaware river to Hudson river at Jersey City. 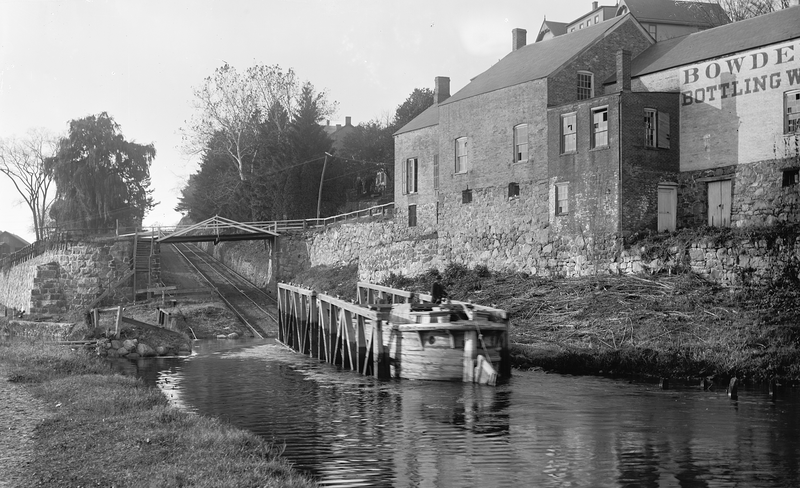 There was 23 water-driven inclined planes the Morris Canal. 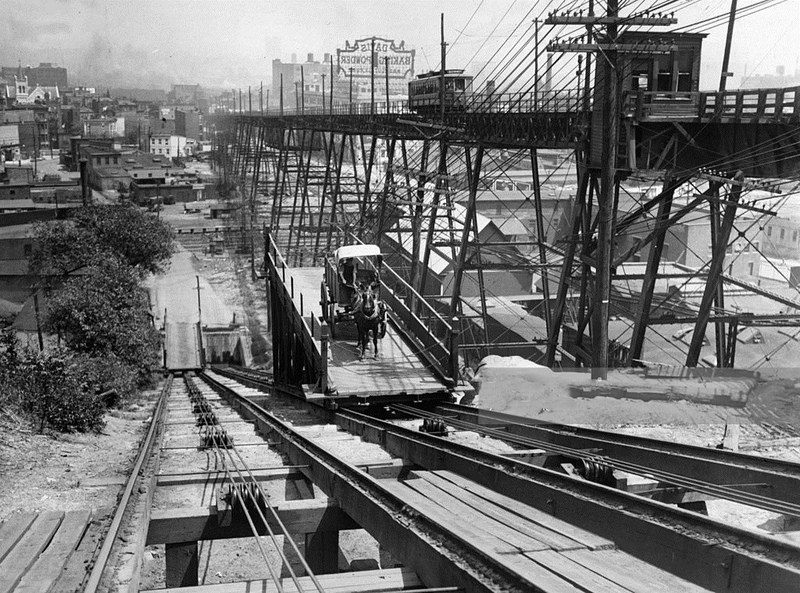 The Weehawken wagon lift was a funicular used to lift vehicles from the foot of Hackensack Plank Road to West Hoboken (now Union City). 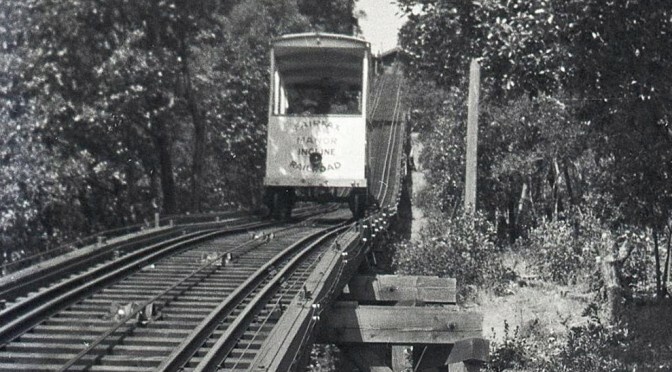 The West Orange Cable Road was a cable railway up the mountain in West Orange. 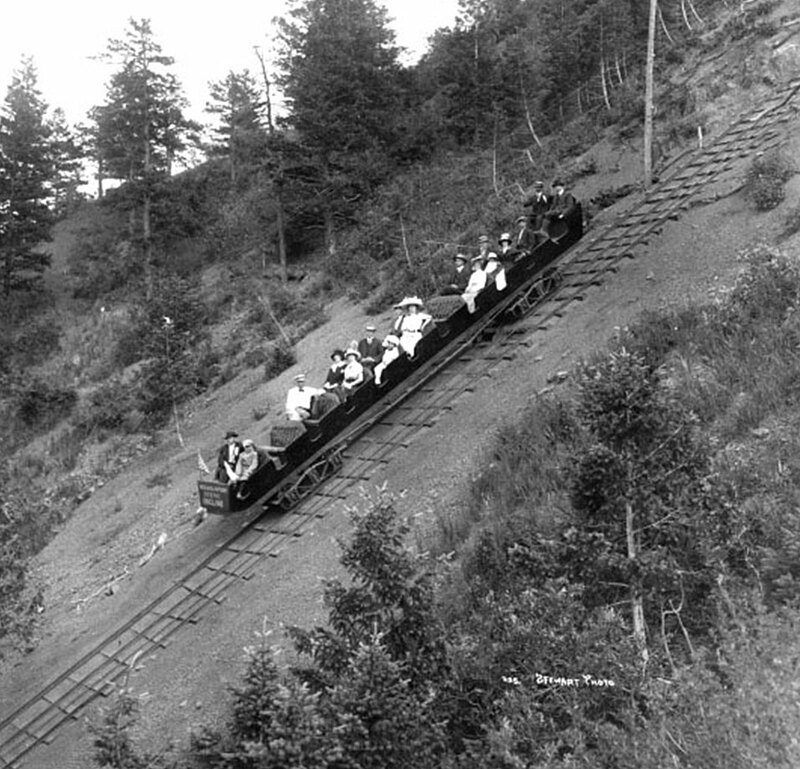 The Lake George Prospect Mountain railway was built by Otis to climb the top of Prospect Mountain west from Lake George City. 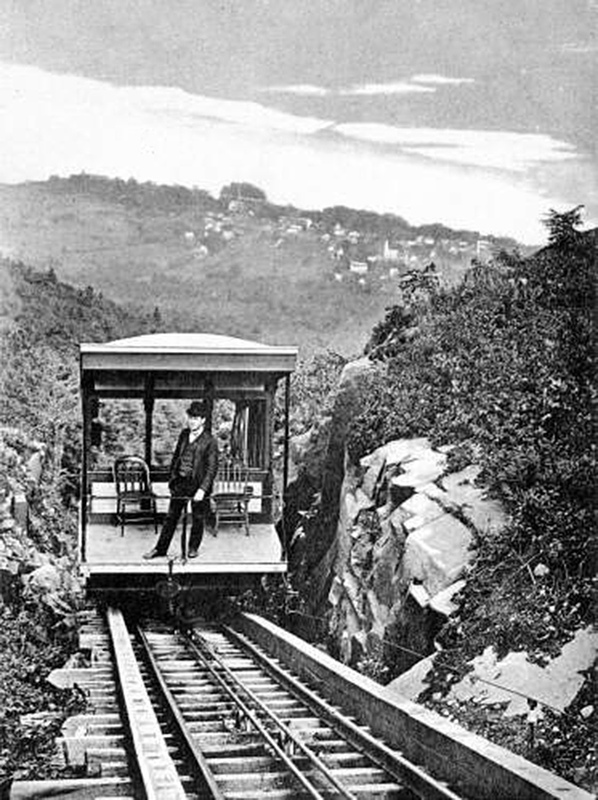 The Mount Beacon Incline Railway was a funicular railroad up to Mount Beacon at Beacon on left bank of Hudson River. 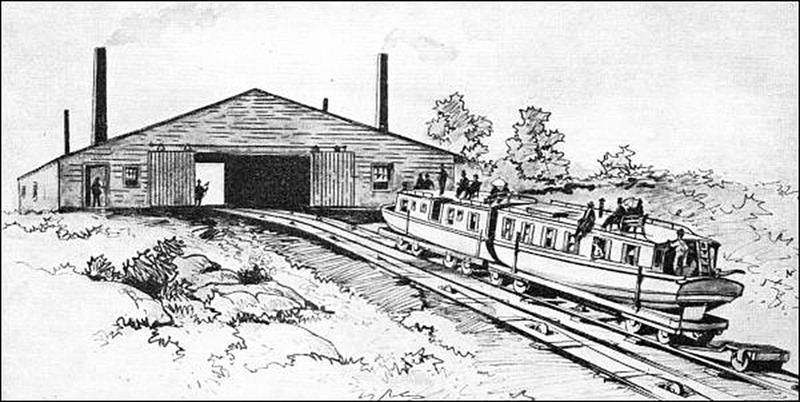 The Otis Elevating Railway was a cable funicular railroad to the Catskill Mountain House in Palenville on right side of Hudson River. 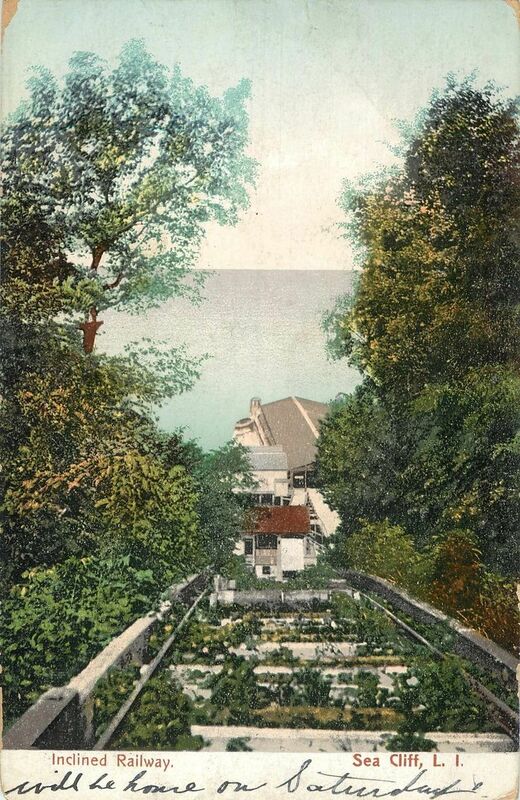 Located at Sea Cliff on Long Island, the Sea Cliff Incline Railway was used to transport passengers of steam boats from the dock to the top of the hill were was the Sea Cliff Hotel. 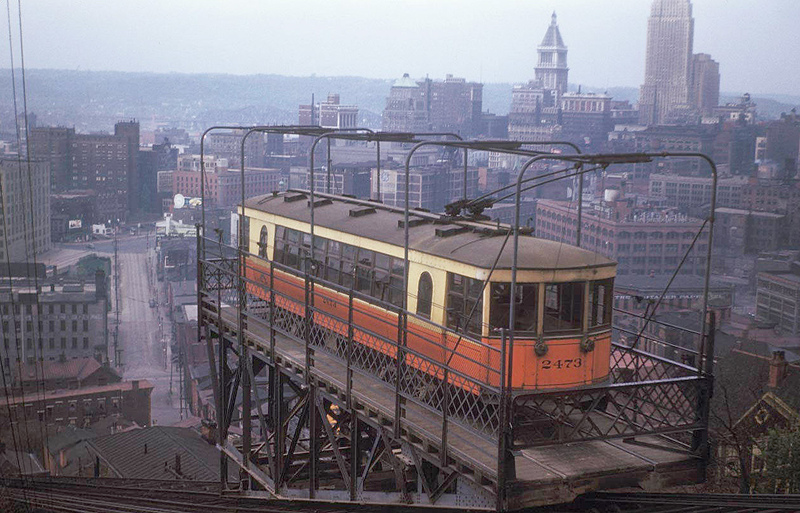 The city of Cincinnati is famous to have been a great city of 6 early big funiculars mainly capable to transport streetcars and other vehicles on the top of the hills but in 1948 all the inclines were gone! 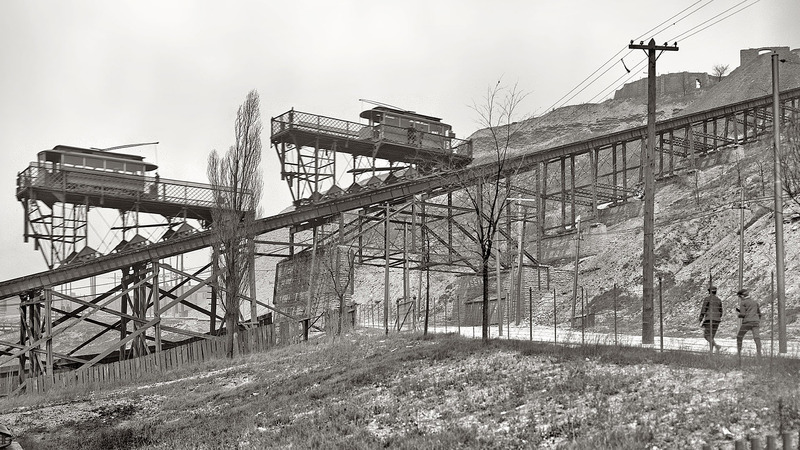 Also known as the Cincinnati & Clifton Inclined Plane Railroad, the Bellevue Incline was able to transport tramway and other vehicles from Elm Street at McMicken Avenue to Ohio Avenue. 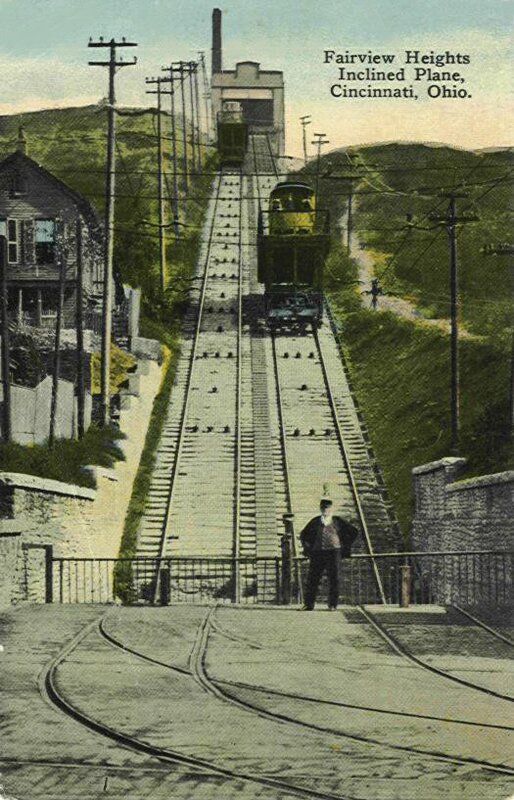 The Mount Adams & Eden Park Inclined Railway was the last and most famous funicular of Cincinnati. 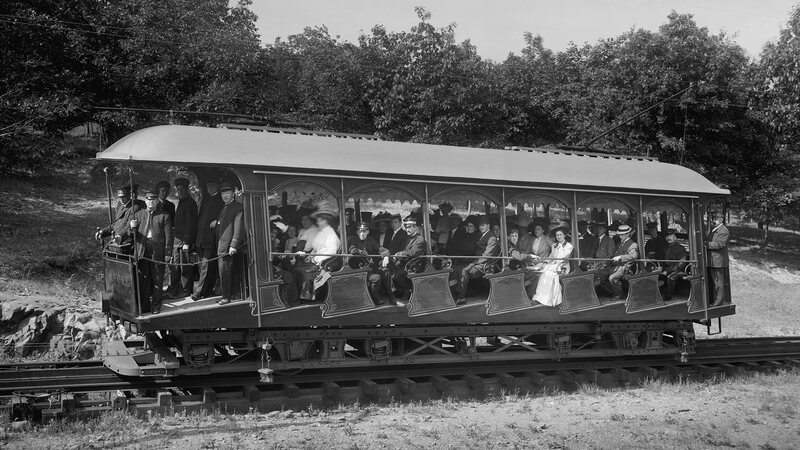 It was designed to transport street cars up to Adams Hill, the Zoo and Eden Park. 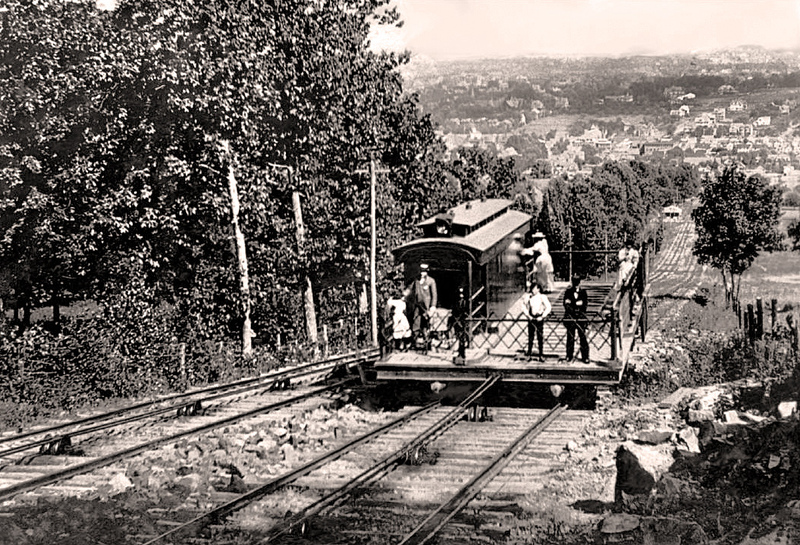 The Mount Auburn or Main Street Incline was the first funicular of Cincinnati. First it was a passenger only incline than it was modified with an open platform to transport tramways and horse-driven vehicles. 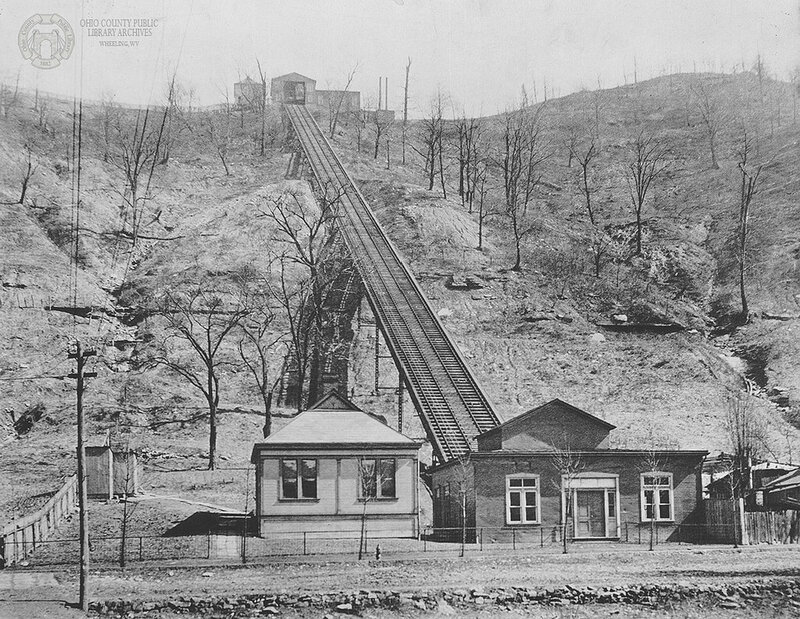 The Price Hill Inclines was composed of two separate funiculars. One was reserved for passengers only (on the left of the photo) and the other one was reserved for freight and vehicles. The Allegheny Portage Railroad was a 36-mile railroad built to cross the Allegueny Moutains and to link Johnstown on Conemaugh River and Hollydaysburg near Altoona. 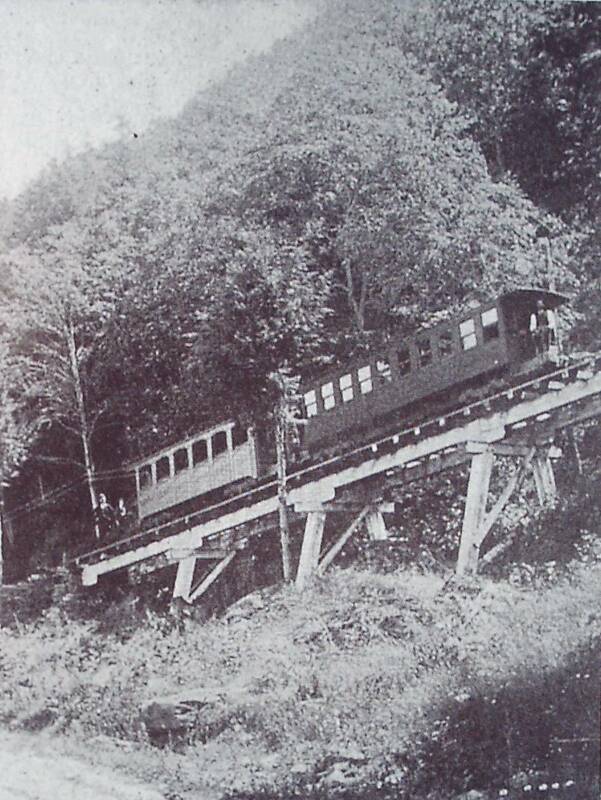 The railroad was able to transport canal boats on rail and over the moutain with 10 funicular inclined planes. More informations about Allegheny Portage Railroad. The Ashley Planes were composed of three inclined planes to transport coal wagons from Mountain Top down to Ashley and the Wyoming Valley. 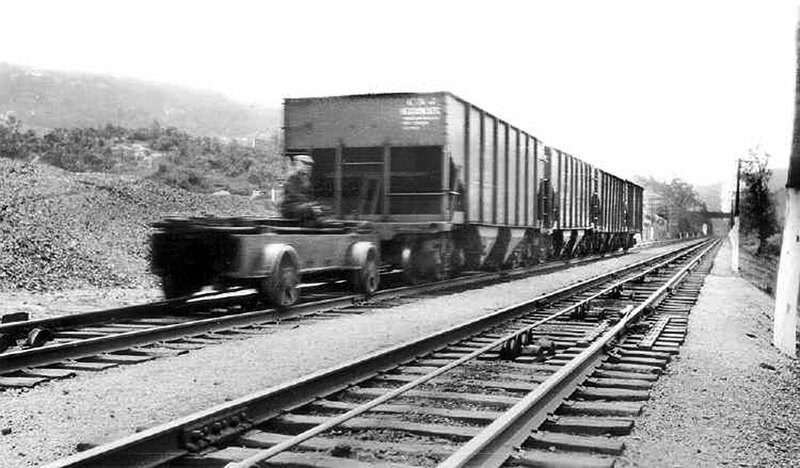 The Hazleton Railroad was in charge to transport coal from Weatherly from top of the mountain down to the Lehigh River valley. Inclined planes were built at Penn Haven (actually Penn Junction) to reach the bottom of the valley. 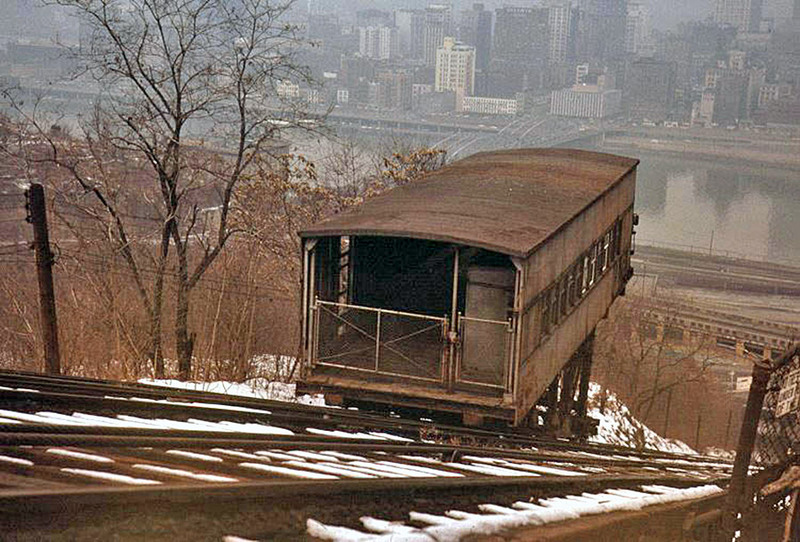 Pittsburgh is unquestionably the American city that has had the most funiculars. The city counted up to 20 funiculars. Today there are only two: Monongahela Passenger Incline and Duquesne Incline. (near the present-day trolley tunnel) to Bailey Avenue on Mt. Washington. It was originally steam powered, and was converted to electric in 1918. Close to it there was also the Castle Shannon Coal Incline in charge to transport and the Castle Shannon South which was a kind of cable railroad to bring passengers to the main Castle Shannon Incline. 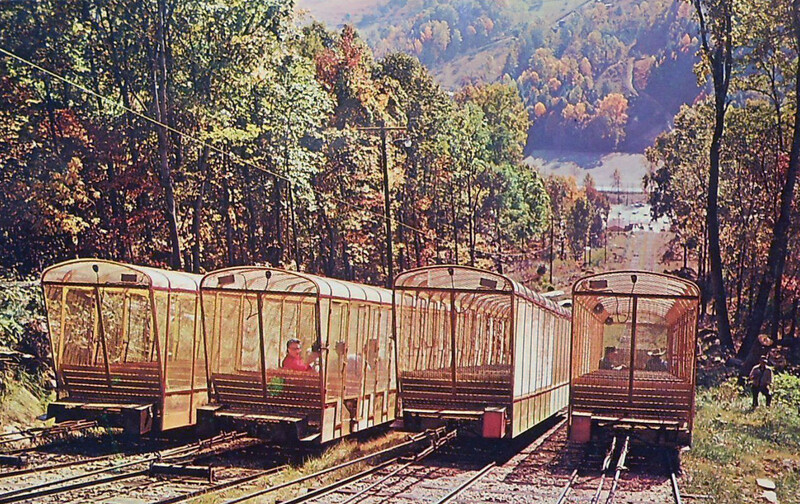 The Monongahela Incline which is still in use since 1870 is the oldest funicular in USA (right on the photo). 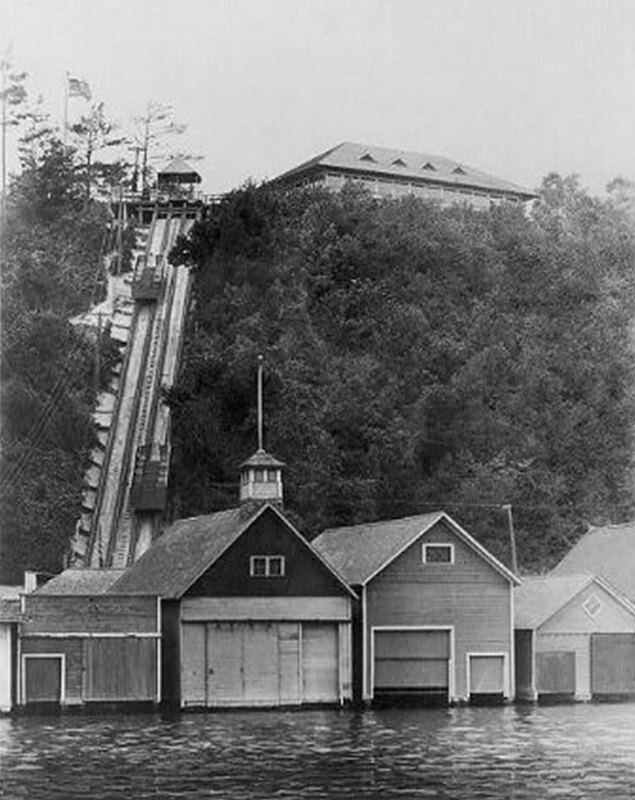 In 1883 a second incline was built just on the left of the 1870 passenger incline. 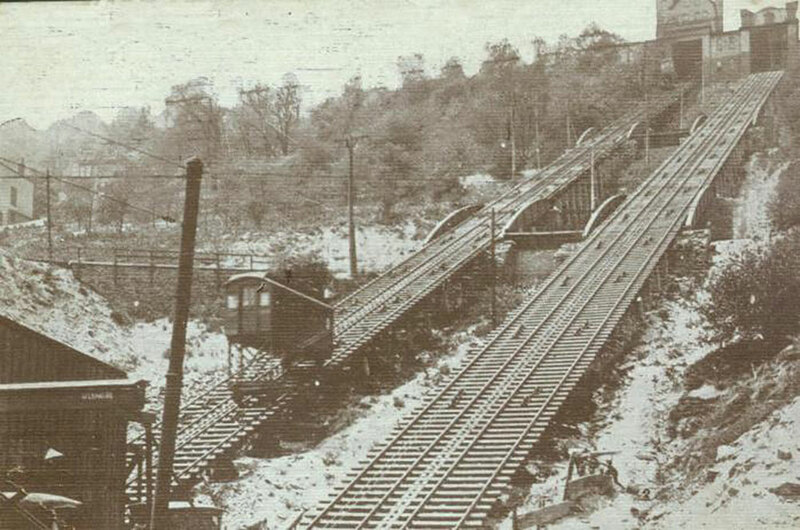 The Monongahela Freight Incline (left on the photo) was reserved for freight and vehicles and was dismantled in 1935. 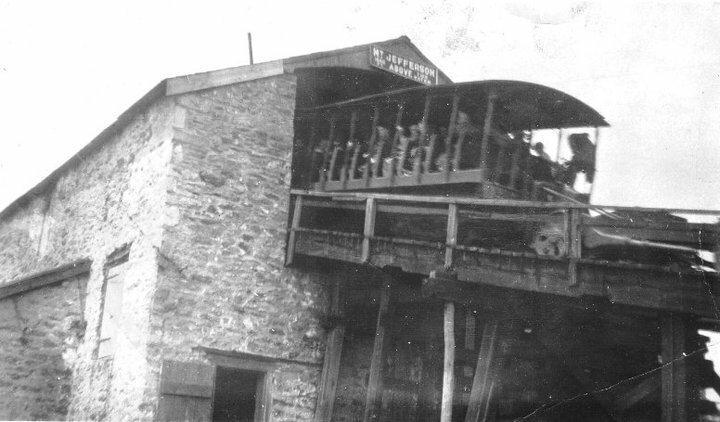 The Mount Oliver Inclined Railway Company built an incline whose engine house was located on Mount Washington near Mount Oliver Street and down to the Southside. 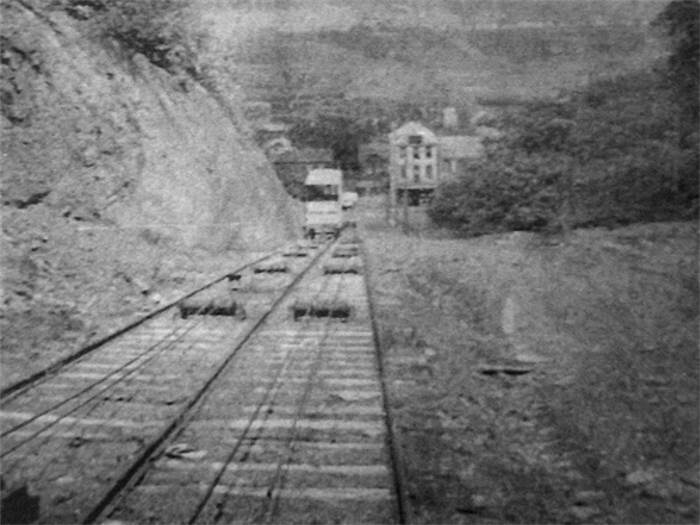 The Norwood Incline (or Penny Incline because a penny was charged to use it) ran from Island Avenue near Adrian Street to Desiderio Avenue between McKinnie Avenue and Highland Avenue McKees Rocks/Stowe. 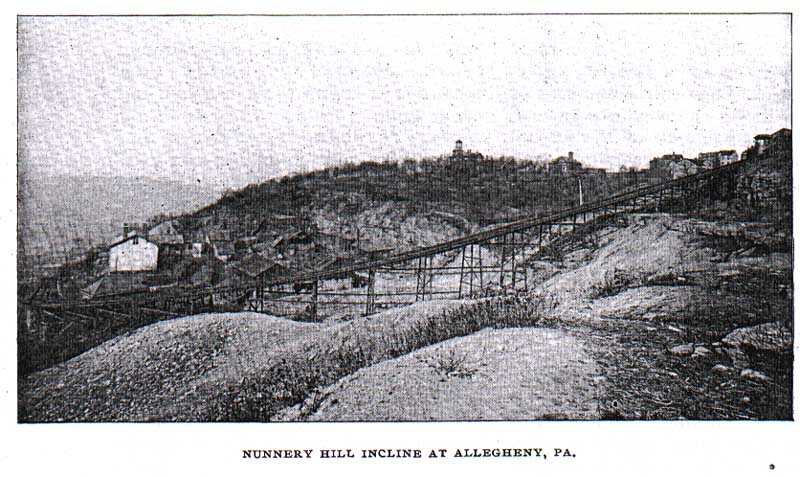 The Nunnery Hill Incline was the first curved track incline in Pittsburgh. It linked Federal Street at Henderson Street (formerly Fairmount Street), North Side, to Catoma Street near Meadville Street (formerly Clyde Street). 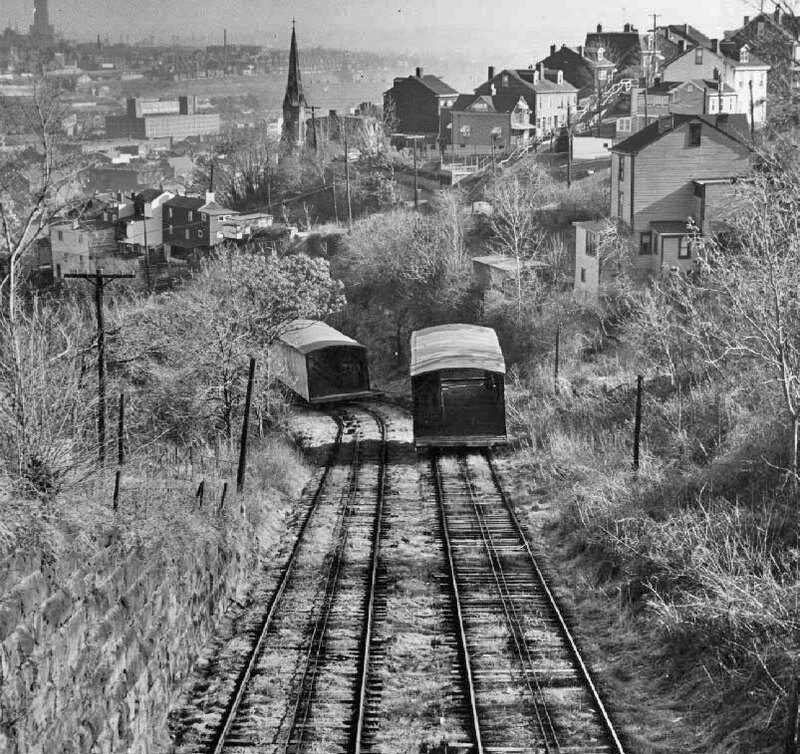 The Penn Incline (or 17th Street Incline) was a freight, vehicles and passengers funicular railway from 17th Street between Liberty and Penn avenues in the Strip District to Arcena (Ridgeway) Street near Ledlie Street in the Hill District. 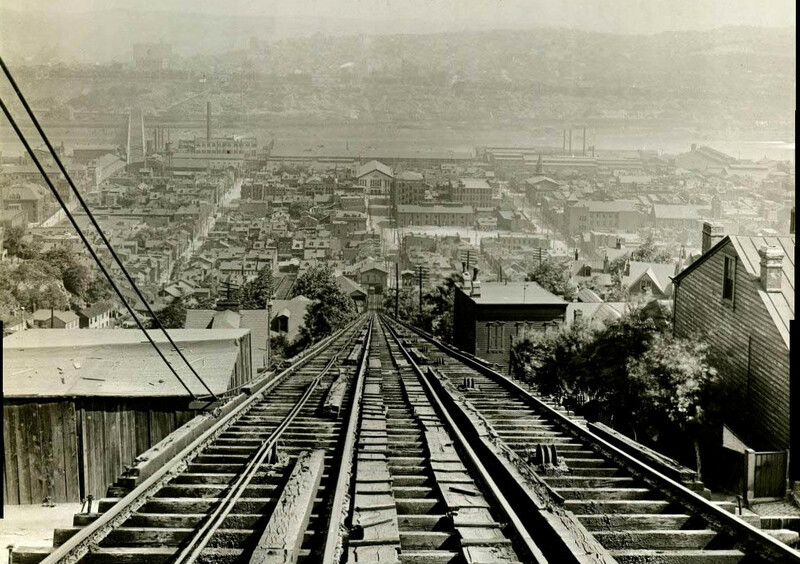 The Knoxville Incline was the longest incline in Pittsburgh with 806 meters and a curve in the middle of the track. It was designed to transport freight, vehicles and passengers from Arlington Ave at Warrington on Mt. Washington down to Bradish Street on Southside. 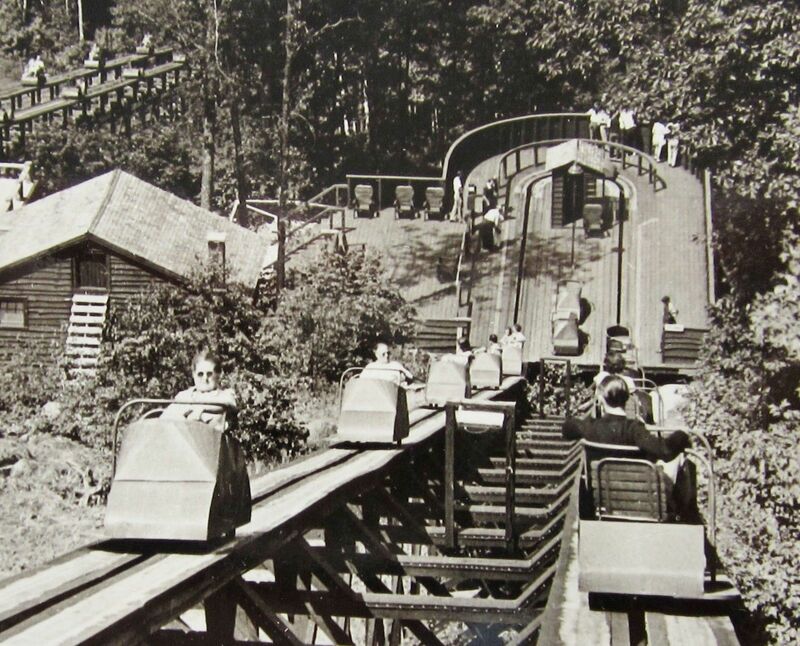 The Shohola Glen Amusement Park in Pike County operated a switch back railroad from using passenger cars salvaged from the Pa. Coal Company Gravity Railroad that operated from Dunmore to Hawley. One section was an funicular inclined plane. 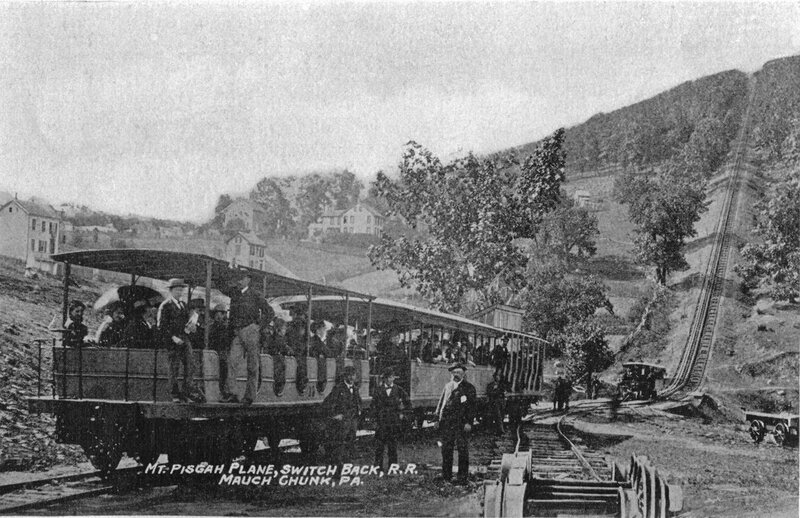 The Mauch Chunk, Summit Hill & Switchback Gravity Railroad was first designed to transport anthracite from mines on hills down to Lehigh River. 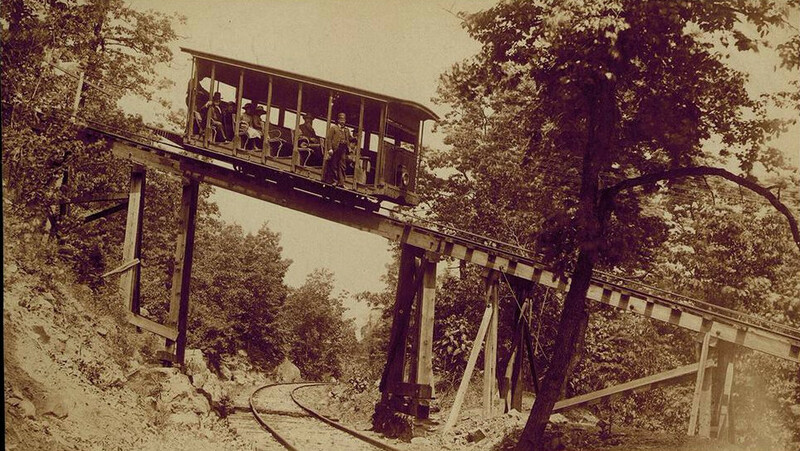 In 1874, the railroad was transformed into a tourist attraction that became one of the first roller coasters. 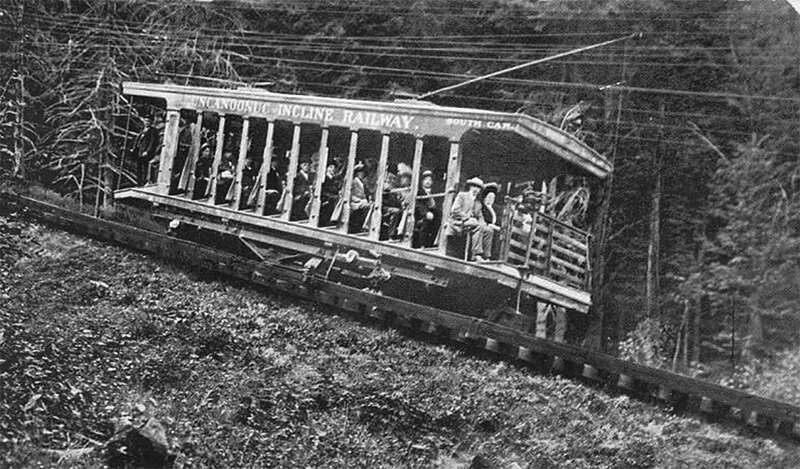 Tourists in cars were pulled up two hills (Mount Pisgah and Mount Jefferson) then the cars were released to follow the railroad by gravity. 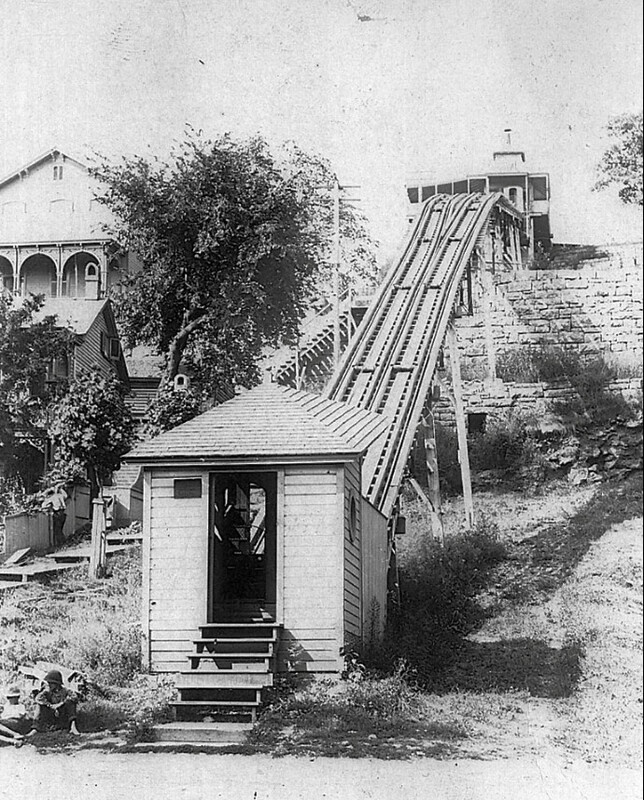 The Lookout Mountain Incline was the first Incline (Incline n°1) at Chattanooga to climb to the Lookout Mountain at the old Point Hotel. 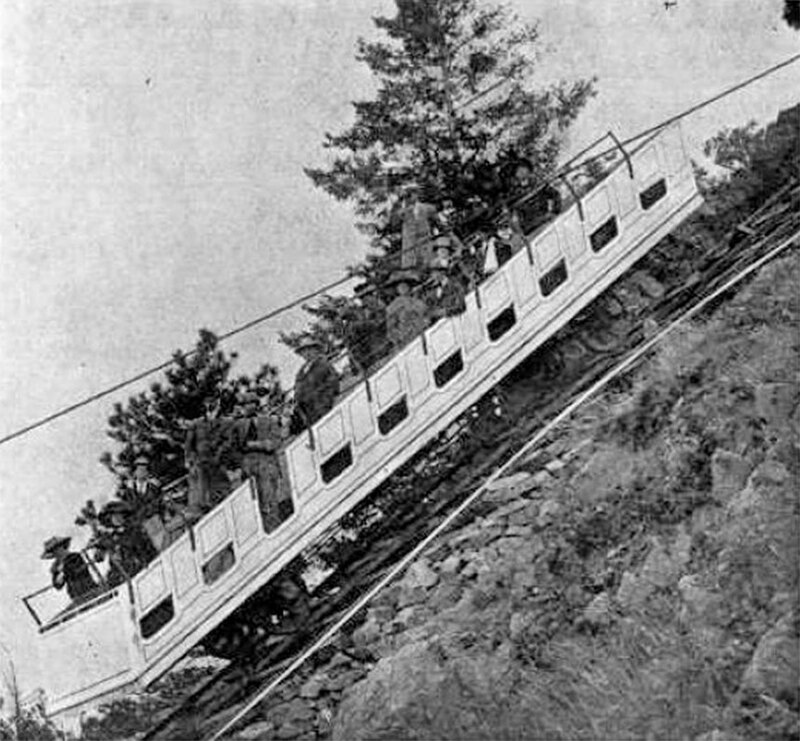 This incline was located few meters beside the actual Lookout Mountain Incline (Incline n°2) which was built in 1896 and then replaced the incline n°1. The Kennecott Copper Mine (today Rio Tinto Kenneecott) is famous for its big open pit mine near Salt Lake City. During decades inside this big pit there was a real village called Bingham Canyon with many railroads. The village was located at the bottom of the canyon and the train station was on the top of the hill. 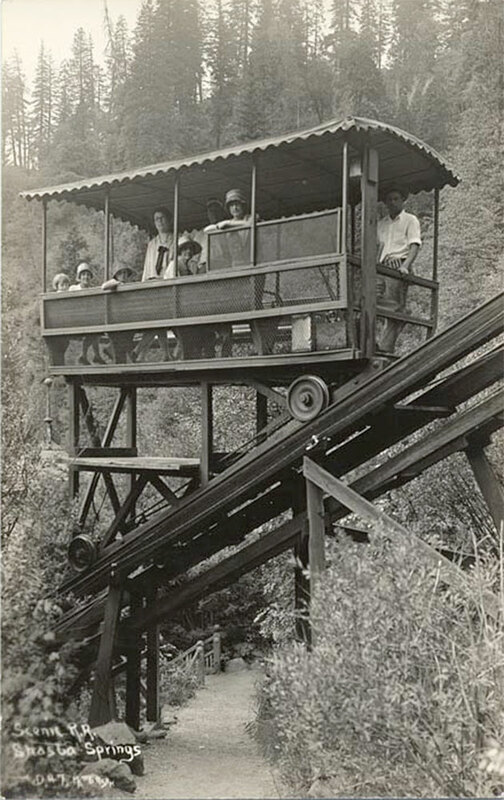 A funicular was built to reach the village from the train station until 1970 when the village was abandoned and destroyed to expand the open pit mine. The Washington Hotel (first named Denny Hotel) was built in 1889 on top of Denny Hill. To reah the entrance of the hotel from Third Avenue a short inclined railway was built. 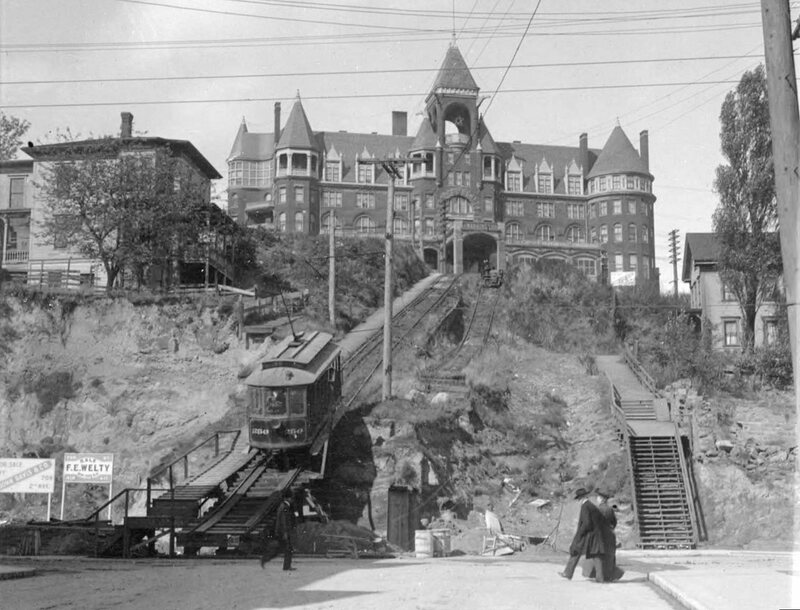 The hotel was demolished in 1907 during the regrade of Denny Hill. May be one of the most spectacular inclined plane ever built. 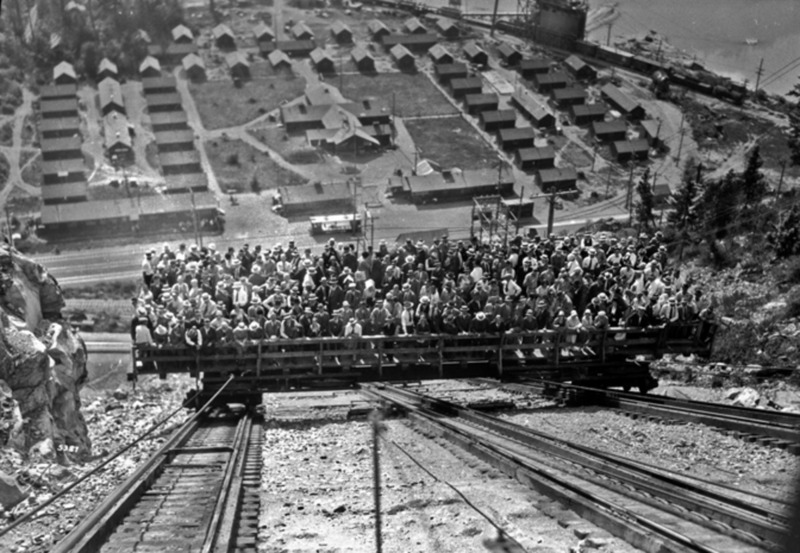 The Skagit Incline was part of the Skagit Electric railway and was built to carried loaded freight cars and locomotives broadside up the hill to the Diablo Dam. The inclined plane was stopped after September 11 2001 terrorist attack for security reason but is still visible. In 1893, a recreational park was built on top of the hill near Mozart area. 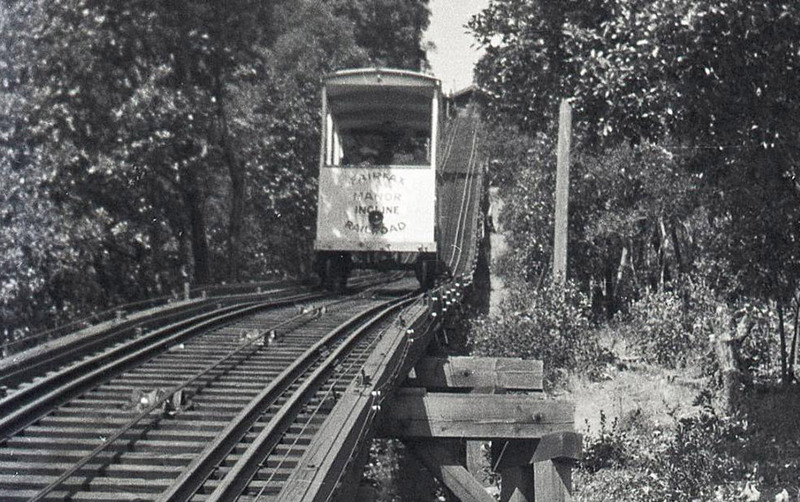 To link the new Mozart Park to South Wheeling, an incline railway was built near 43rd Street. It operated until 1907 and was replaced by a street car. The Mozart Park itself remained open until 1917. 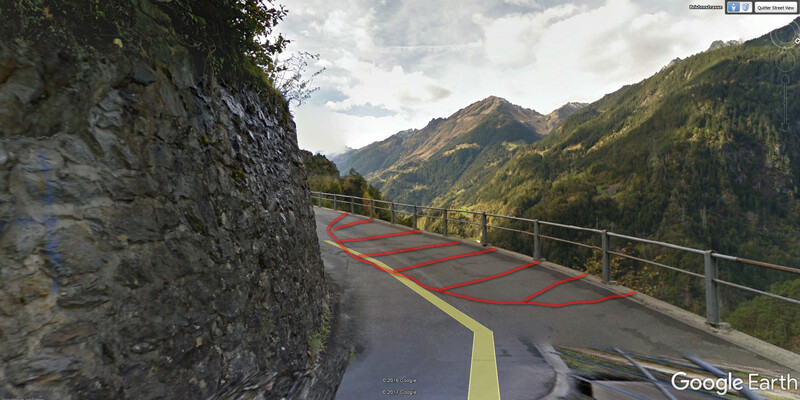 On 6 March 2017, the Amsteg – Bristen road collapsed at practically the same location where a rock was dynamited in April 2003. The road has to be repaired and secured which will certainly take several weeks. The village of Bristen is thus completely isolated. As in 2003, the only connections between Bristen and the valley are the trails and the helicopter. The former funicular of Amsteg power station will therefore resume service to bring people into the valley. In 2003, Garaventa had completely renovated and equipped the 1918 funicular to carry passengers. After the reopening of the road in mid-June 2003, the funicular was finally stopped. 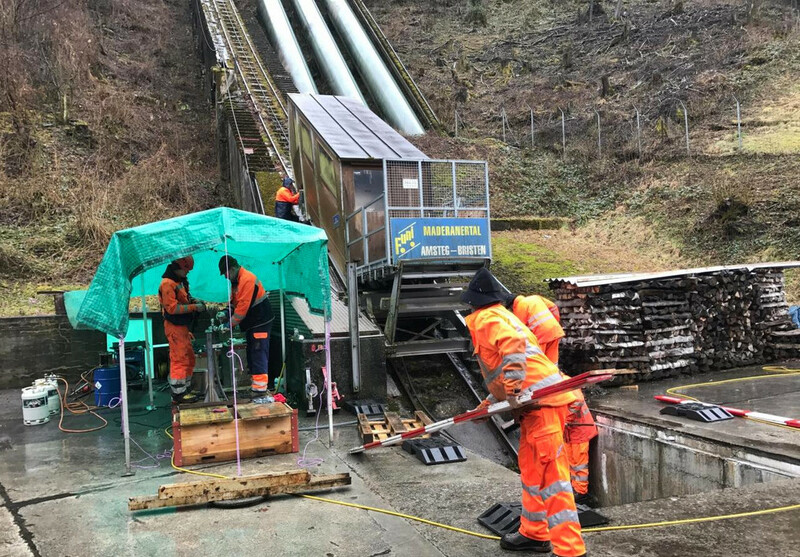 This year the funicular will be awakened, checked and restarted from 15 March 2017 until the Amsteg – Bristen road is reopened again. Le 6 mars 2017, la route Amsteg – Bristen s’est effondrée pratiquement au même endroit où un rocher avait été dynamité en avril 2003. La route doit être réparée et sécurisée ce qui va prendre certainement plusieurs semaines. Le village de Bristen se retrouve donc complètement isolé. Comme en 2003, les seules liaisons avec Bristen sont les sentiers pédestres et l’hélicoptère. L’ancien funiculaire de la centrale électrique d’Amsteg va donc reprendre du service pour amener les personnes dans la vallée. 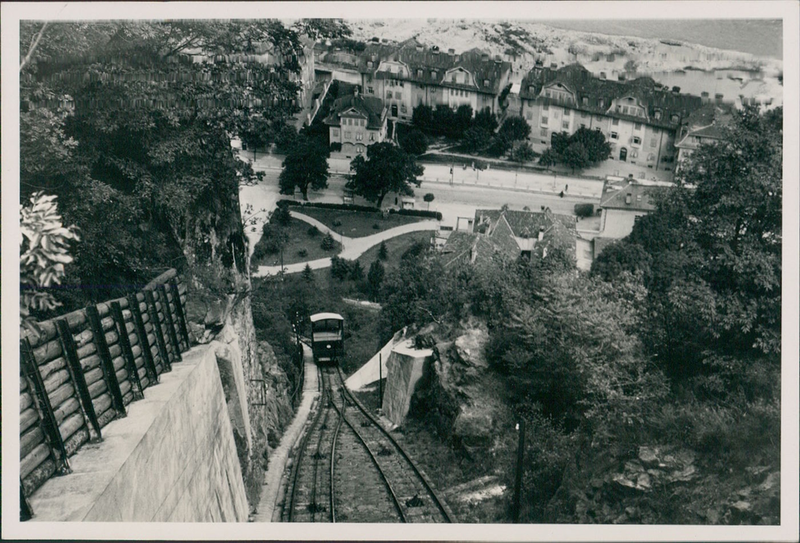 En 2003, Garaventa avait complètement rénové et aménagé le funiculaire, qui datait de 1918, pour pouvoir transporter des passagers. Après la réouverture de la route mi juin 2003, le funiculaire avec été arrêté définitivement. Cette année, le funiculaire va donc être réveillé, vérifié et remis en service à partir du 15 mars 2017 jusqu’à ce que la route Amsteg – Bristen soit de nouveau ré-ouverte. 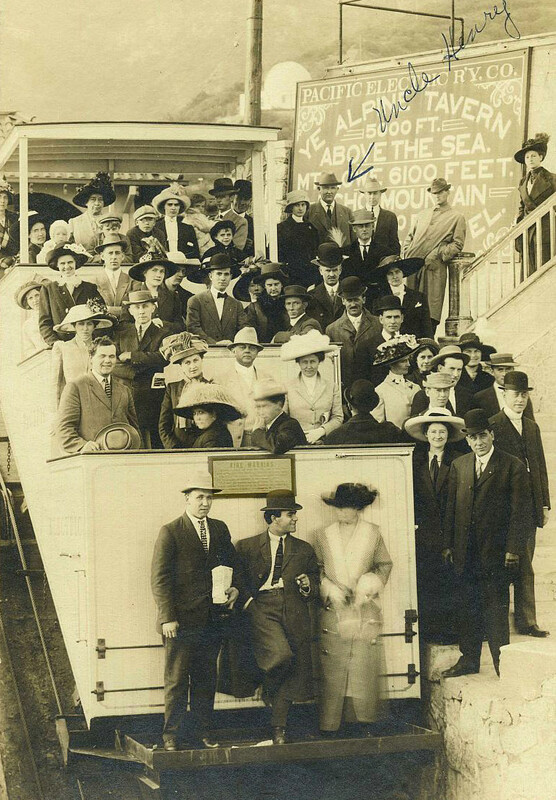 Great and rare photo of the Fairfax Manor Inclined Railroad (1913-1930) in Marin County (California). It was an inclined railway with only one carriage and a counterweight. The carriage was rolling on the external pair of rails while the counterweight used the internal pair of rails. So… the counterweight was flat and passed under the carriage at the middle point. Exceptionnelle et donc rare photo du Fairfax Manor Inclined Railroad (1913-1930) dans le Comté de Marin (Californie). Ce fut un funiculaire, aujourd’hui complètement disparu, à quatre rails avec une seule cabine et un contrepoids. La cabine roulait sur la paire de rails extérieurs alors que le contrepoids utilisait les rails intérieurs. Le contrepoids était donc plat et passait sous la cabine à mi-parcours. Thanks to Joe Thomson and Guy Span for the photo in Northwestern Pacific Railroad Historical Society.